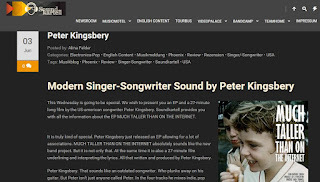 German blog Soundkartell wrote an all-out positive review of the Much Taller Than On The Internet-EP (and video), but managed not to mention the producer, musician, composer at all (that's Umpff, folks). But still, some PR is better than none. Read the review in English here. Watch the film and videos here.